Suspicious stains have been found on the front passenger seat of a car belonging to a female local administration official in Si Sa Ket’s Kantharalak district who went missing on July 3, police revealed on Thursday. Juthaporn Oun-on, 37, disappeared while allegedly collecting a debt from an Army officer at Ubon Ratchathani’s Warin Chamrap district military camp. 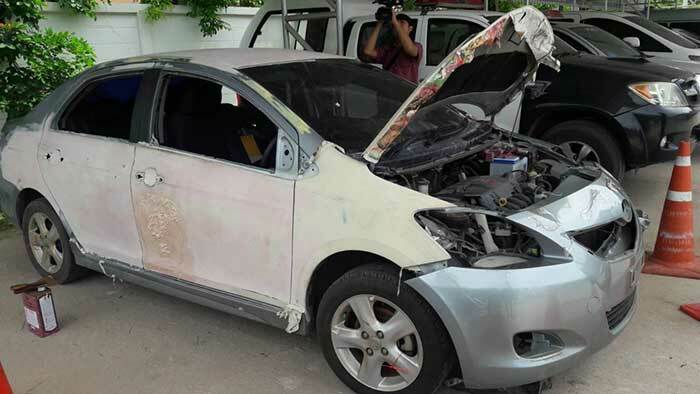 Police Major-General Chairat Sri-iam, commander of the Police Forensic Science Centre 3 in Nakhon Ratchasima, said Juthaporn’s car had been sent for an additional forensic probe – including tests on the stain found on the front passenger seat – which should yield results in two days. Any DNA sample found during the probe will be compared with samples of Juthaporn’s hair and personal belongings, he added. Police discovered Juthaporn’s Toyota Vios on August 8 at an Ubon garage after it had been resold three times. An inquiry into the car’s sale led to the questioning of Army Captain Supachai Paso, 30, a close associate of Juthaporn. Police subsequently charged him with illegal detention, stealing the car or taking it into his possession, using fake documents, and destroying another person’s documents leading to damage – all of which he has denied. Meanwhile, the missing woman’s mother Laem Oun-on and elder sister Maipong have filed a petition for Prime Minister General Prayut Chan-o-cha’s help to speed up the investigation. They said they were confident the prime minister could help them and would not take sides with any military men who might be involved in the case. The pair submitted the petition letter along with a police complaint and the receipt for the car’s purchase via the public complaint centre at the PM’s Secretary’s Office in Bangkok. “I’m still hopeful of seeing my daughter [alive] again,” Laem said.